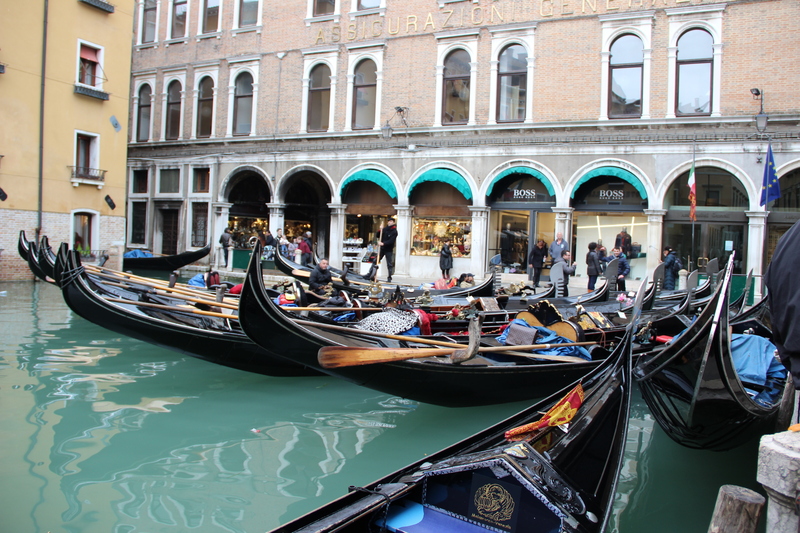 I went through my study abroad program, AIFS, over the first weekend of March. The weather was rainy and sunny, which is my favourite kind of weather to explore and photograph in. 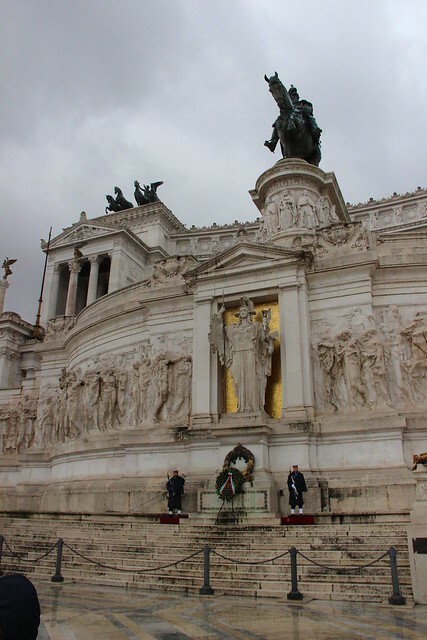 Rome is only about 3 hors away (by train) from Florence, and the first thing I ran out to see when we arrived to our hotel was the National Monument to Victor Emmanuel II. It’s pretty cool, but interestingly the locals aren’t too fond of it. 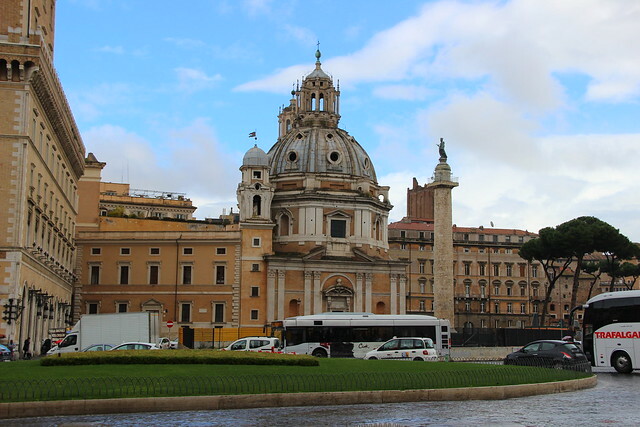 It’s considered to large and grandiose to match Rome’s other buildings, and is visible from almost every part of the city. It’s thought to be too boxy, and (in addition to lacking a tower or dome) it is glaringly white, standing out conspicuously among the surrounding brownish buildings. The weather was so pretty! It had just rained, so the steps up were shiny and the sky was gorgeous. 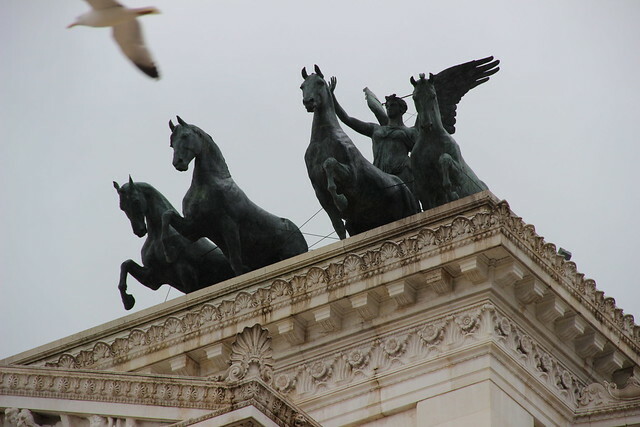 Detail shot of one of the rooftop pieces on the National Monument to Victor Emmanuel II (who was the first king to rule a united Italy). 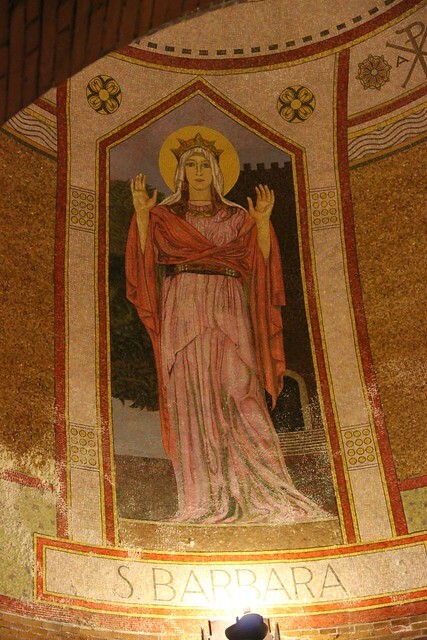 The goddess of Victory is depicted here. View down after clambering partly up the monument. I love the reflections on the wet stone and the sky! It made me feel so happy. I think the inside is some sort of military museum now. Another interior shot. Saint Barbara is the patron saint of military engineers, among other things, so I guess it makes sense that she was depicted inside the military museum/exhibit/collection-thing. 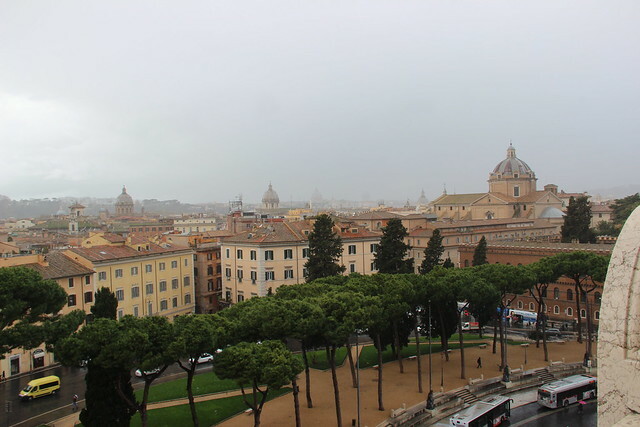 View off of the Capitoline hill (on which the Monument to Victor Emmanuel II/the “wedding cake”) is built. It was amazing. The clouds looked so wild and interesting that day too! I loved photographing them — I’m slowly learning more about my camera as I click along. Currently I’ve been enjoying manipulating shutter speeds and ISO. 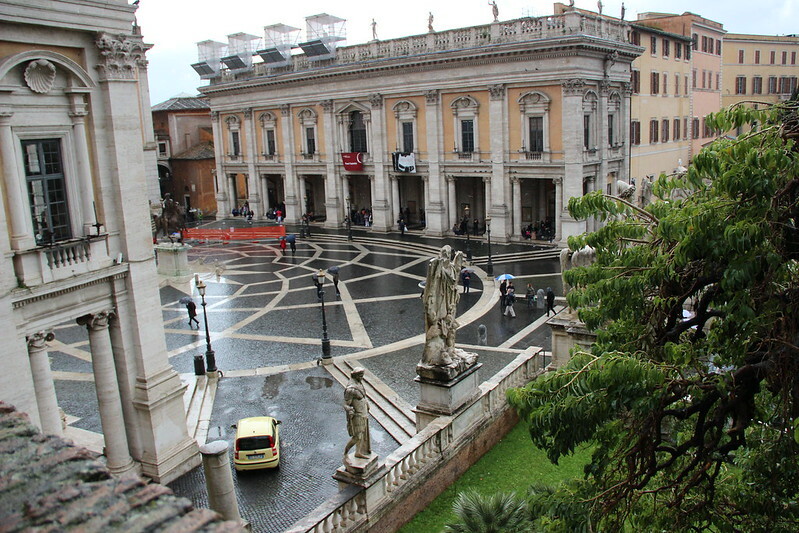 Same vantage point, just looking down to my left into the Piazza del Campidoglio, which is on top of the Capitoline hill. There’s also a church right next to where I stood to take this picture, and it is absolutely gorgeous — it was one of my favourite churches as far as it’s beautiful architecture and design. One our way to the Colosseum with our tour guides! There are ruins visible over that railing there. This is the Colosseum. It is ringed with 80 entrances (basically every arch visible on the bottom floor), each of which is numbered. Important political figures during Roman times often funded the entertainment to win public favour. Gladiator fights and many “sea battles” were depicted here — in fact, the entire floor of the Colosseum was flooded for the opening performance which featured some sort of sea battle. 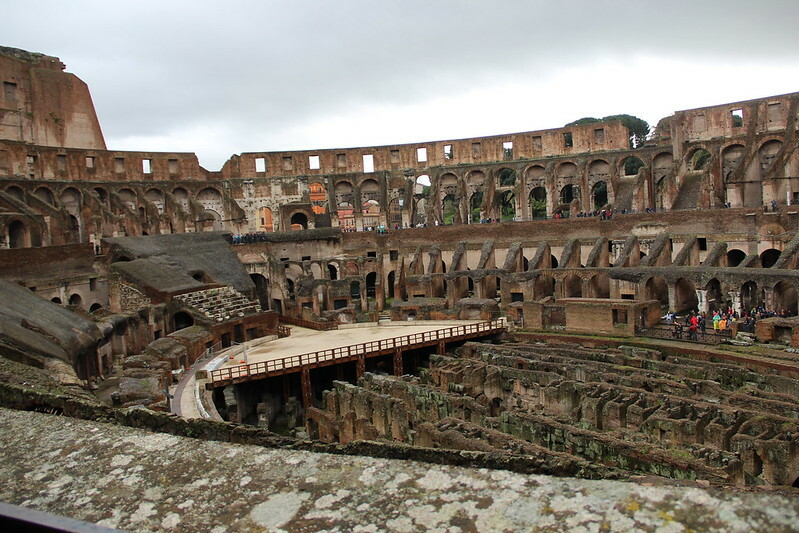 The Colosseum was actually built over what was once King Nero’s artificial lake on his personal property, which was filled with pavilions and gardens. King Nero had built a large landscaped villa in the heart of Rome on the Palantine hill after a fire in 64 A.D. burned down the aristocratic houses that previously occupied that space. 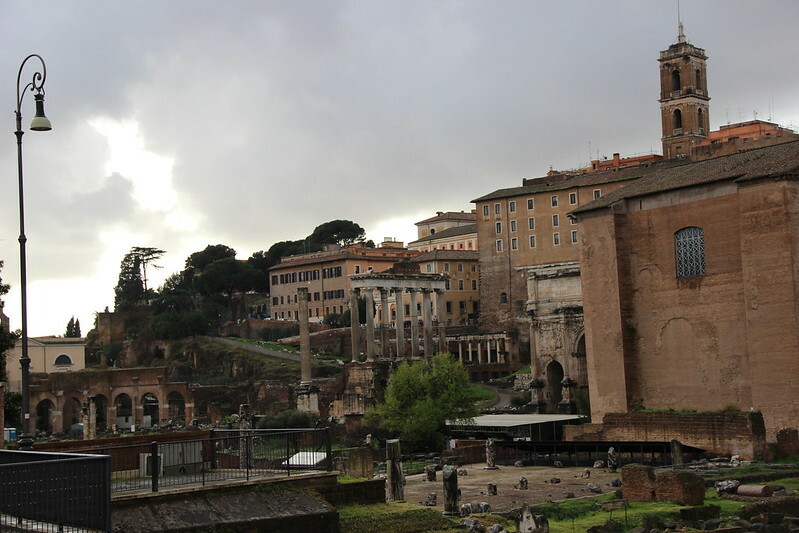 King Nero was basically hated, so when he died Emperor Vespasian wisely converted the area into public land that was essentially dedicated to pleasing the Roman populace. 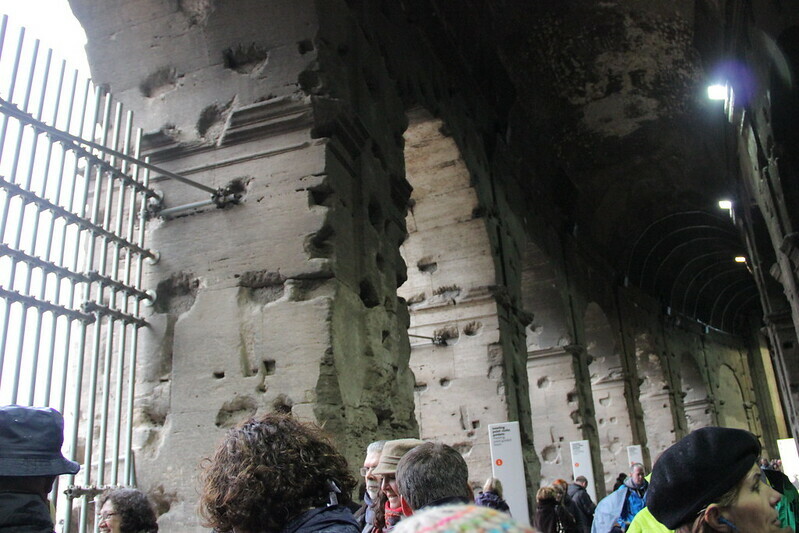 In the old entrances of the Colosseum. 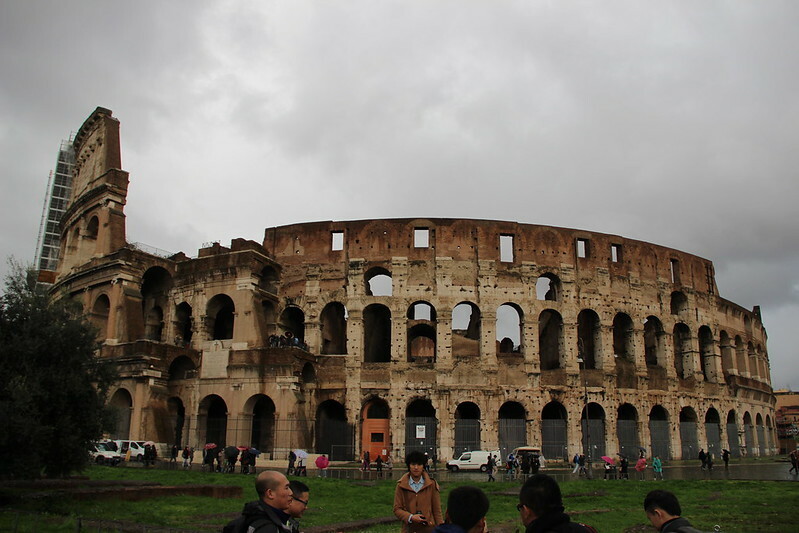 Note: there is only ONE Colosseum, and it is in Rome. 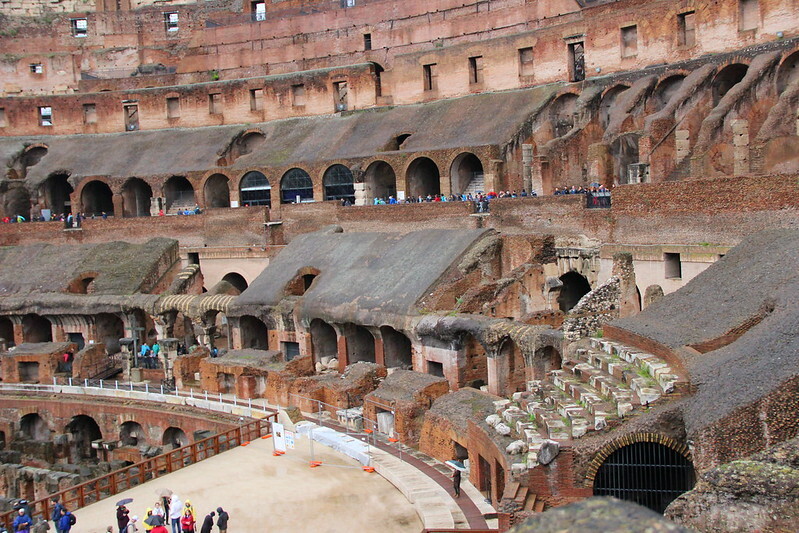 The other structures people tend to call “colosseums” are actually Roman amphitheaters. Here you can see all the odd holes in the columns/pillars. 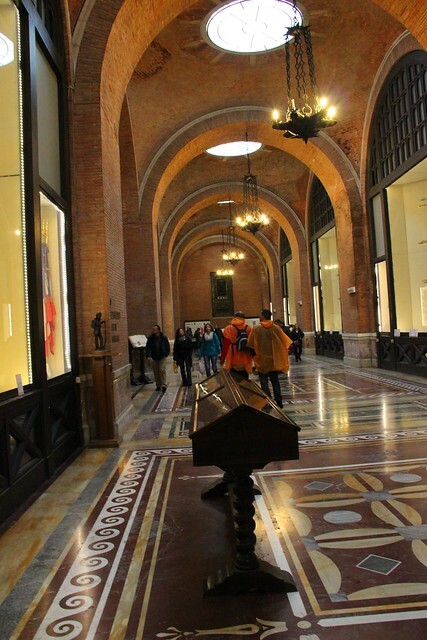 When they were built, metal rods were used to help align the stone. Later on this metal was reused and removed from these pillars, leaving them with a pockmarked appearance. In the Colosseum! Those top levels have suffered a great deal, but those top seats are originally where the Romans permitted the women to observe from. Men and their mistresses could sit close to the arena (the wives sat in the top seats). Those white stones on the right are meant to be a recreation of how the steps would once have looked. 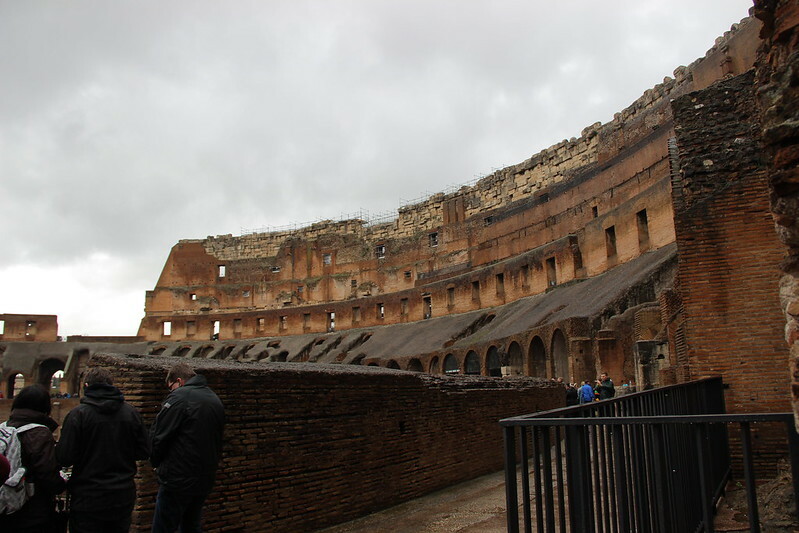 The Colosseum was a lot cooler than I anticipated! It’s not a disappointing, gross old ruin, but quite interesting to walk around. The exposed area was originally hidden — that part wasn’t mean to be seen, and it’s between 2-3 stories below that tan flooring. 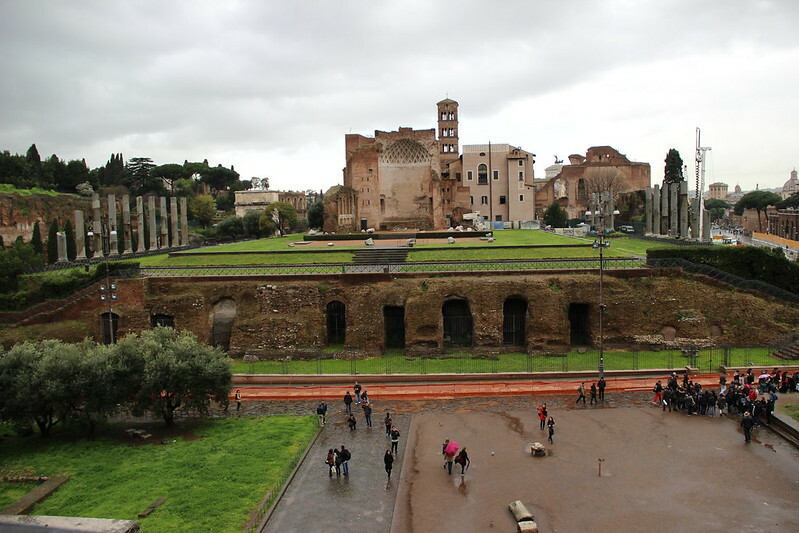 You can basically consider the lower are as a sort of “back stage” where things were managed, and the old pipes of Nero’s artificial lake were sometimes utilised for performances. The tan part is a reconstruction of the level on which the original gladiators would have stood. The gladiators were basically the celebrities of their time, and were the key components of the entertainment system of Rome. A typical career lasted around 20 years, if you managed to live that long. Also, not all gladiator fights ended with the death of one competitor — good gladiators were a valuable financial investment by their sponsors, and fights were sometimes rigged due to the heavy betting centred around the fights. I can’t remember what this is, but it’s right by the Colosseum. 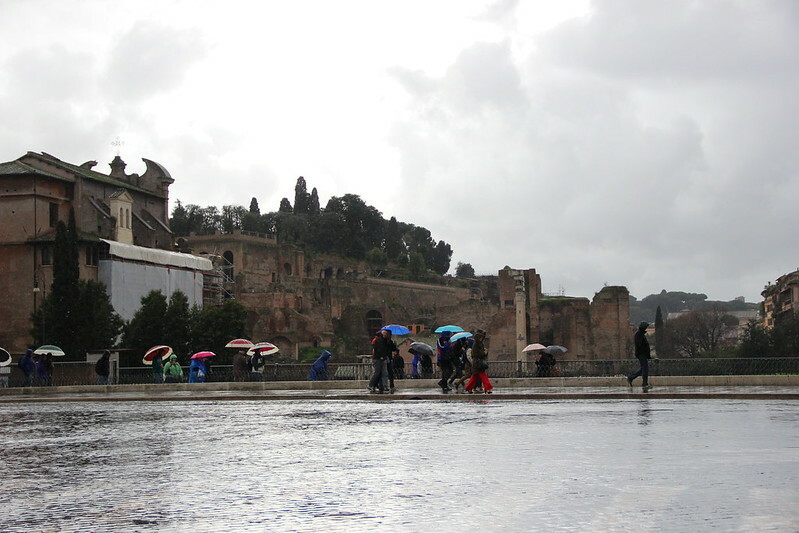 It was pouring rain during most of our tour, and because the Forum was flooded we didn’t get to go see that unfortunately. I can’t quite remember what this was either! 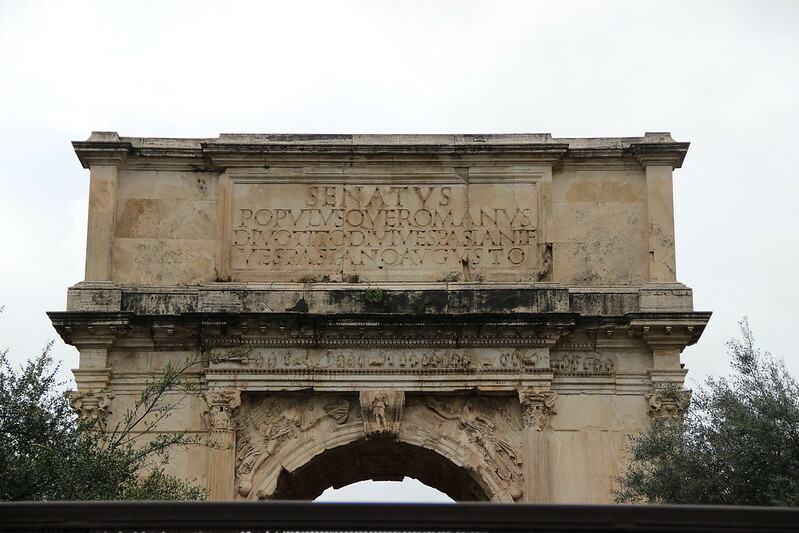 It may have been the entrance arch to Nero’s gardens and house. It’s right next to the Colosseum. 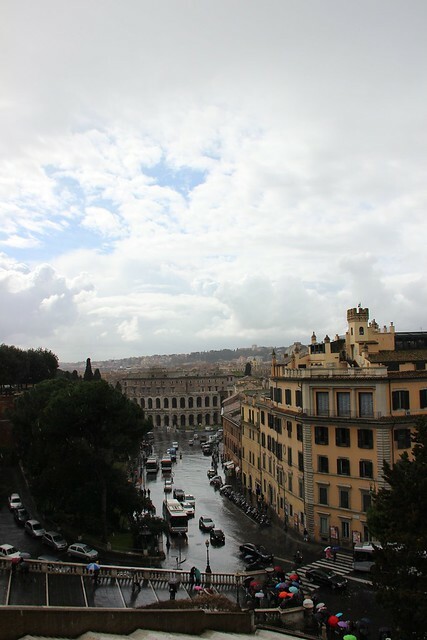 The view of one side of the Capitoline hill on our return from the Colosseum. 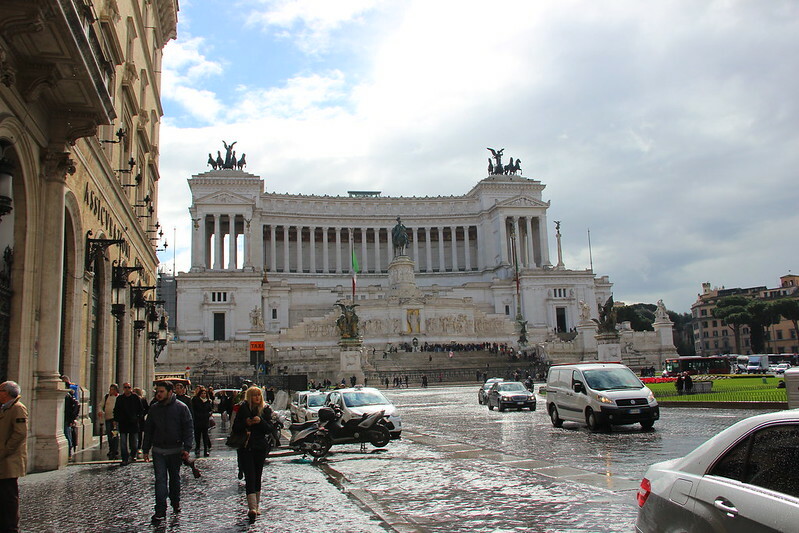 First impressions of Rome: it’s definitely built on a large scale — they have wide streets and many lanes with pretty intense traffic that I found intimidating even with over a month of practice dealing with Italian traffic in Florence. The building styles are very different, and there are a lot of preserved ruins smattered around the city. Like I just mentioned though, the first thing that struck me was how large all the structures and roads were. This is a general travel trip, but use your free time wisely. 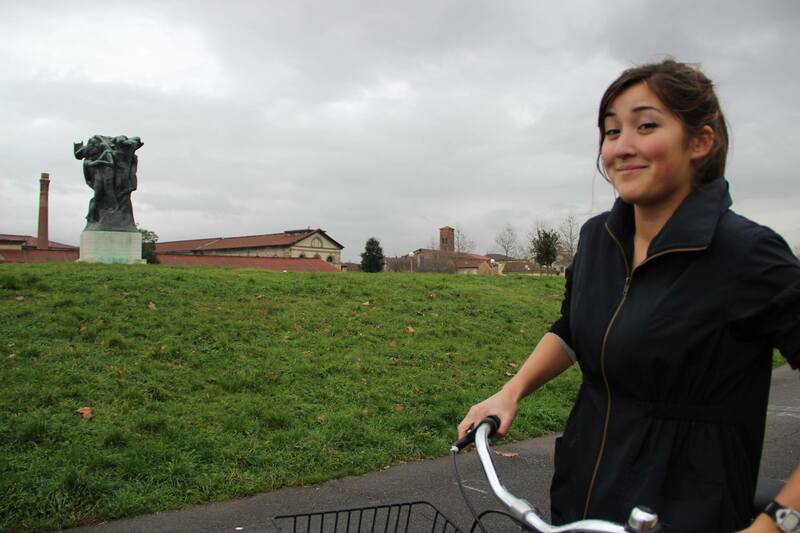 Sometimes it’s worth it to skip a meal and use free time to go explore. Check the weather — it was pouring rain at certain points, but my trusty water proof jackets, umbrella and rain boots kept me happy. 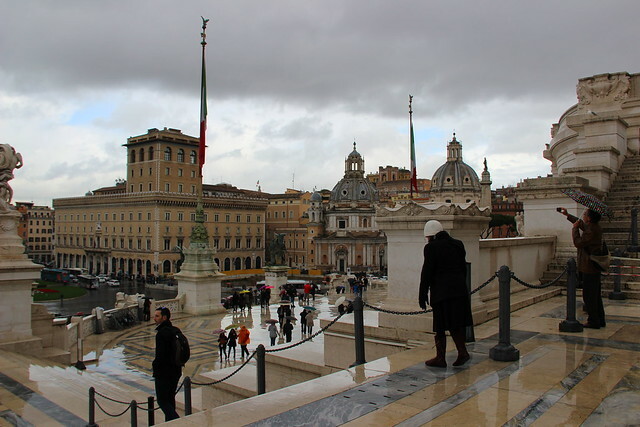 Climb up the monument to Victor Emmanuel II until you end up outside and can’t find any more stairs to climb. Find that church I mentioned — it’s really, really pretty, and I’ve basically been poking my head into every single church I come by in Italy.